Whoops. Wrong album. That said, the tortured soul of The Smiths might have slithered its way into the conscious of Montreal’s Majical Cloudz to fuel Are You Alone? The tracks on the album are more so the kind that depressed individuals tune to while stuck in their cars on a heavily rainy day. Devon Welsh isn’t disingenuous when he talks about suicide; this record works like a tell-all series (“Are You Alone?,” “Easier Said Than Done”). Matthew Otto’s electronic contribution allows for tones appropriate for a funeral march (“Disappeared”), a trip to heaven (“Silver Car Crash”), or solitary confinement that leads to much-needed philosophizing (“If You’re Lonely”). Majical Cloudz aren’t a one trick pony that dabble in sadness. In “Downtown,” ’70s retro keys bring in Welsh’s contemplation of trips downtown with a loved one, finding respite from darkness in the process. “Change” may be a tame track when compared to “Game Show,” a song with synths that act like people wanting to stop one from suicide. 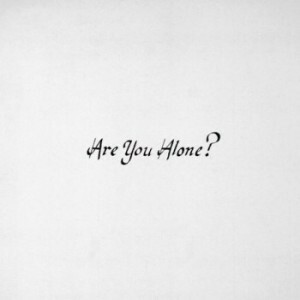 Are You Alone? will make your heart feel something it’s scared of, and that’s a good thing.